The best IOS emulator for PC windows with app store used to run Apple iPhone and iPad apps will be discussed in today’s topic. As we know that Apple iPhone is one of the famous and competitive brands among other in the market, all is due to its features and other huge variety of apps and Games available in the Apple app store. The persons having iPhone and Ipad can equally enjoy the ios apps both on their devices as well as on Computer and laptop. But what about the persons that have no iPhone and want to experience these ios apps and Games. 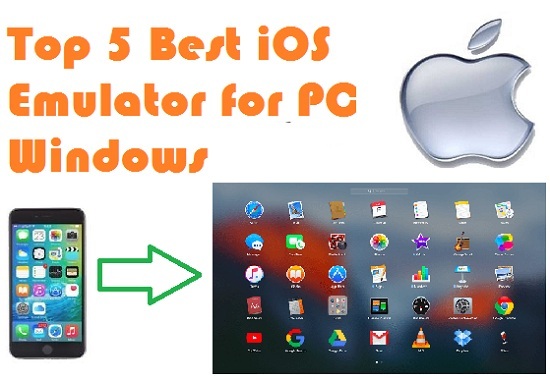 So, don’t worry, because there is a huge collection of best iOS Emulator for PC, through which everyone can run and enjoy all iPhone and Ipad apps on Windows equally. Before proceeding to the collection of best iOS emulator for windows, let’s see first what are these iOS Emulators and why we need them..? Emulators are virtual machines that support the operation of an application that belongs to a different operating system and run them seamlessly. So, get ready to have real experience of iOS applications on your Windows PC. These emulators are especially helpful for developers who want to check cross-platform compatibility of their applications and also for those who have not an iOS device. Although there is a huge collection of iOS emulators, I have shared some of the best iOS Emulator for PC along with iPhone, iPad Simulators among them. MobiOne Studio is one of the best iOS Emulator for PC and Windows. It enables to run all applications and Games to run on Windows PC even having no iOS device. It works for developing cross-platform mobile apps for iOS and Android systems. With MobiOne Studio. you can configure your apps to run on your iPhone device and can also build status notification on the desktop of every application downloaded. All applications run on this software are built with the latest technology and are compatible with all devices. iPhone Simulator is a type of iOS Emulator for PC through which users can enjoy a true interface of iPhone on their Windows PC. It has come up with some of the latest technology through which you can test and use different apps on your computer. You can also access your iPhone which enables you to use its build in apps as well as to control its system preferences. iPadian is a kind of Simulator specially designed to control and access full interface of your iPad. It has some of the best and advanced features to customize and control all existing and newly downloaded apps on the device. By using this Software you can feel and touch the new iOS 10 on your Windows system with amazing features like iMessage, Siri. Appetize.io is another online iPhone emulator for PC windows that can be used to run iOS applications as well as Android applications too. If you are a developer and want to test your apps then this platform will be a great tool for you. You don’t need to have an extra emulator for iOS and Android. Xamarin Testflight is another useful emulator for iOS apps that comes with user-friendly interface and advanced support. All you need is to download and install iOS emulator on your computer in order to run iOS apps. All the apps and games will run on your Windows computer without any interruption. In this way, the above collection of the best iOS Emulator for PC and Windows will give you true iPhone and iPad interface, and also help to test your iOS apps before launching or using it directly into your iOS device.